Janice Horton - author of romantic adventure novels: Spellbinding Fun Today! Blurb: How Do You Voodoo? Loveless fashion model Nola Nichols thinks being beautiful is a curse; that is until she is cursed and her looks begin to fade just a week before the most important photo shoot of her career. How Do You Voodoo? has already been attracting some fabulous reviews on Amazon UK and Amazon US and has been described by top book bloggers as “a really fun and heart-warming read to curl up with over Halloween” (Love Reading Love Books) and for its novella length “perfect for commuting” (Jera’s Jamboree). It’s my party gift to YOU. So please click on the links and download it to your Kindle today and be sure to tweet and share and tell all your friends to do the same. It will be back at 77p / 99c tomorrow. Other Amazon sites are also included! No Kindle? No problem. Simply download the Kindle app from Amazon first – it’s free too. Click Here to go to Amazon to get a free app for your iPhone, your tablet, iPad, Laptop, Mac or other electronic mobile device. I’ve invited you all here today to cast a magic spell – it can be anything you wish – and I can’t wait to see what you’ve all been cookin’ up! 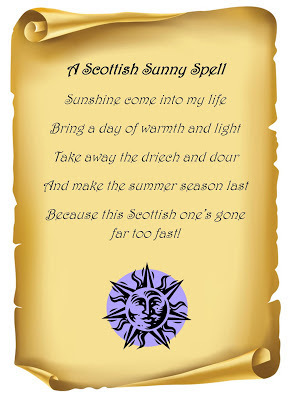 This is my spell: It’s a Spell of Scottish Sunshine! It’s been a very wet and dreary summer here in Scotland or as we like to complain “a dreich and dour” one. So I’m going to rub some suntan lotion into my hands and chant this spell while I evaporate a drop of toads sweat from a silver spoon over a candle flame – and hope it works! So now it’s almost time to visit all The Spellbindingly Fun Party Peeps! Each has a magical spell cast on their blogs today, so do pop over and leave a comment, share their links and click on their Twitter button. On Twitter do remember to include the #voodoo in all tweets and please RT those you see in your Twitter stream today – as there is a prize draw for two of these voodoo love dolls just for #voodoo RT’s and MT’s! Love is bewitching! Sometimes love needs a wee nudge. 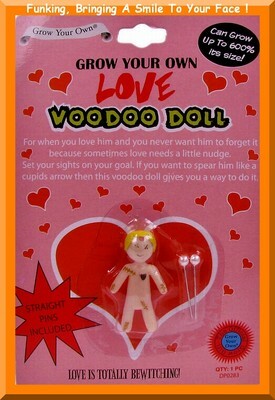 This voodoo doll gives you a way to spear him like a cupids arrow! There is also a fabulous grand prize draw for all those party peeps who are casting spells and listed below. The prize is a beautiful Scottish Candle from The Highland Collection that reflects the contemporary essence of Scotland. It is a scented candle mixing delicate white heather with sweet Highland honey to produce a sensuous scent evoking the feeling of romance. It is a scent capable of transporting you to the beauty of the heather-covered hills of the Highlands. 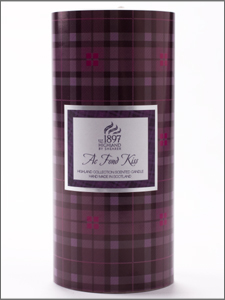 This candle is beautifully packaged in tartan and in a shade to exactly match the colours and the tartan cover of How Do You Voodoo? This scented candle, beautifully packaged in tartan and and in the exact shade of the cover of How Do You Voodoo? is capable of transporting you to the heather covered hills of the Highlands! Do click on each of the Party Peeps names below to see what spells they’ve been cooking up. I too will be visiting each and every one of them during the day to read the spellbindingly fun post and to leave a comment. 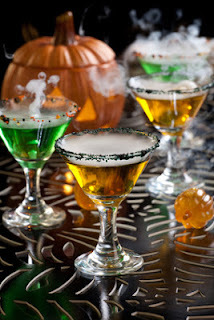 I’ll also be popping onto Twitter using the hashtag #voodoo to keep up with the voodoo chatter until I need to pop back and refill my chalice with a Voodoo Cocktail (see the fun recipes below for ‘The Voodoo’, The High Priestess’ and ‘The Witch Doctor’!) but take it easy – they are all incredibly potent! Music: Join me in a wee dance about to ‘The How Do You Voodoo Playlist’ which contains such classics as ‘Black Magic Woman’, ‘I Put A Spell On You’, ‘Devil Woman’, ‘I’m Your Witch Doctor’, ‘Evil Ways’ and ‘That Old Devil Called Love’. Well, a party’s not complete without some magical music, is it? The Voodoo: Dark Rum (to ward off dark spirits), Apricot liqueur, Blue Curacao, Tropical Fruit Juice, Grenadine. Serve tall over ice. The High Priestess: New Orleans Vodka, Mango Juice, Anisette Liqueur. Serve with ice and mint leaves (to ward off evil spirits). The Witch Doctor: (Recipe courtesy of the Voodoo Lounge in Las Vegas) Light Rum, Dark Rum, Peach Schnapps, Cruzan Raspberry Rum. Pineapple Juice. Grenadine. Sour Mix. Stir and serve over ice. So please do have a voodoo drink, have a wee voodoo dance, visit as many blogs as you can over the day and make your presence known to all the spellbindingly fun party peeps. Pop onto Twitter and use the hastag #voodoo to get together with other voodoo tweeps. Do send and RT tweets in your timeline with the hashtag #voodoo to be entered into the draw for the Voodoo Bewitching Dolls. If you are curious about the research I did for this novella at Glasgow’s ‘City of the Dead’, I’m talking about it over at The Romantic Novelist’s Blog today while over at the wonderful magazine style blog Loveahappyending.com there is a special promotional voodoo post that you might want to tweet and share. 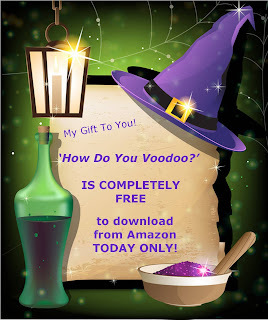 Lastly, don’t forget to download your FREE copy of How Do You Voodoo? today and spread the word to your friends and followers. It’s FREE for TODAY ONLY! Get How Do You Voodoo? Other Amazon sites are included! Oh - and please leave a comment here on my blog – I’d love to know if you’ve enjoyed the whole voodoo party thing and, if you do read and enjoy ‘How Do You Voodoo?’ I’d also love you to consider leaving a favourable review on Amazon. Good Luck today with your blog party. You have worked so hard to make it spellbindingly fun! Good morning everyone and welcome to the Spellbindingly Fun Party! Cup of tea it is then! Have a fantastic day today, Janice! Will support as much as I can - have iPhone will tweet!! Super spells so far! Thank you Mandy - I can imagine you dashing about today, waving your iPhone about like a magic wand! Thanks for all your support and tweets - I really appreciate it! Hi Emily! Thank you for your lovely comment. I'm having a giggle over my toast and coffee now at the spells I've read so far - how funny and CLEVER they all are. Can't wait to see what spell you have cast and to find out if it comes true! Happy Launch Day, Janice. I've cast a spell to make it go with a bang. Hope you have a wonderful launch day, Janice! Off now to read some more spells! Wow - this is so exciting! Spells and wands and candles and magic! Thanks so much for your support everyone. I'm having great fun working my way down the party peep list and keeping an eye on Twitter which is #voodoo crazy this morning! Great party,Janice and you well deserve your success after all your hard work! Enjoy the rest of your day. Thank you Nicky - go easy on those cocktails now - they are highly potient potions lol! Great spell today by the way!! Hi Miss Book Worm - thanks for your lovely comment - have a great day too and do download your free copy of How Do You Voodoo? It's my party gift! Hi Myra - and thank you - I think I should have cast a 'be everywhere at once' spell today as it would have been most helpful! I'll have to wait until I get home to have a cocktail. I'll have one of those nibbly things though. And one my 'More time in the day' cakes. Which gives me enough time to go and check out all the other spells. This is a brilliant idea and a fabulous party. I have just got in and can't wait to hop about and see what everyone has been up to. Just grabbing a cocktail and a quick dance to 'Devil Woman' first. I wish you a whopping huge success with this novel. If it is anything like your others then it's sure to be a hit! Hope you're having a brilliant day Janice! This is a great idea and a super party! Cheers. Hi Rhoda - you clever cake maker and also spell maker you! I'll have a few of those 'more time fairy cakes' please - and you get about 90mins more time in each day with each cake eaten, you say...? Pure genious - and so delicious! Thank you Carol! I'm so impressed with everyone's spell making skills - yours included - you made me laugh so much this morning! Do bring your mother along and we'll have another cocktail. I'll put 'Devil Woman' on - we can have a wee dance about! Hi Lindsay, my lovely! I'm having a fantastic day thank you and it's all down to how wonderful and supportive and FUN everyone has been. Thanks so much! Great party, Janice. I'm really looking forward to reading HDYV. All the very best of luck with it! Thanks very much everyone - it's taken me all day but I finally got around to each and every blog to comment on your spells and tweet your links. I'm in awe of how clever you all are - and imaginative and unique - as not one spell was duplicated. It seems we all wish for different things in life! I did empathise with many of the spells though - and my goodness if those spells work - then I want to be the first to know about it! You are all such a fantastic support and so much fun. Thank you! Brilliant party, Janice! I've been hopping from place to place reading all the different spells, too. It's been a blast! 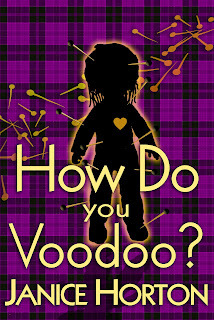 Wishing you a hugely successful launch for How Do You Voodoo? Congratulations on your book release; launches are simply glorious days, n'est-ce pas?! You had me at Scotland and Hallowe'en, by the by. Other than France, and my dear California, I've yet to feel more at one with a location than Bonnie Scotland. (Of course, my Mum's fam is chock full of MacPhersons and Grimes; so, perchance it's an ancestral pull?) Anyhoo, I look forward to reading your novella! Apropos to the rain, I wish I could conjure up some empathy :D Moi, I live at the beach in San Diego and, whilst it's bonkers-gorgeous all the time, I do crave a bit of the "dreich and dour" once in tartan moon. 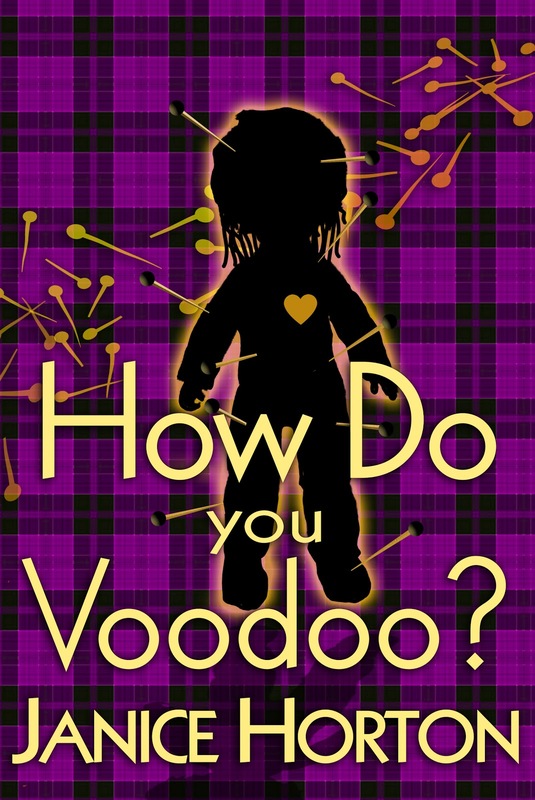 I found Janice Horton's novella, "How Do You Voodoo?" to be charming--or, to speak in this genre--bewitching & enchanting. It was a lovely two hour read. Thank you Fishducky!! I'm so pleased and delighted that you enjoyed reading How Do You Voodoo? and that you took the time to write and put a review on Amazon for me - it's fantastic of you and I really appreciate it. Amazon readers are looking for well reviewed books and so you have been really helpful. Thank you for your support. Thanks everyone for all your support yesterday - it was such fun - and I'm still amazed at how clever and inventive you all were with your spells! Thanks also for all the shares and tweets and retweets. My youngest son is home at the moment - so I got him to do the prize draw to make it all fair. For Tweeting and Retweeting - it's Sheryl Browne and Nicky Wells who win the two voodoo love dolls! I'll be emailing the winners for their postal addresses over this weekend. Thanks everyone. I wish I had prizes for everyone who took part and I do hope you will enjoy reading your copy of How Do You Voodoo? If you do enjoy it - please feel free to tell your friends and followers about it and that it's just 77p /99c on Amazon to download and it's free for Amazon Select members. The first chapter is also avalable free on Amazon as a sample. Also, if you do enjoy reading How Do You Voodoo? please do consider leaving a review on Amazon.